Shanghai, China, December 14, 2015 /ChinaNewswire.com/ - The Westin Bund Center Shanghai in downtown Shanghai has announced the appointment of Greg Findlay as General Manager. Drawing on over two decades of experience with Starwood, Findlay is responsible for all operations at Shanghai's iconic hotel just minutes’ walk from the historical bund waterfront. 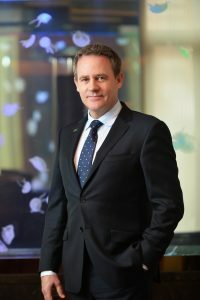 After successfully launching The Westin Auckland in 2007 and The Westin Siray Bay Resort & Spa, Phuket in 2010, he took up the role as General Manager at Asia's first W hotel – W Seoul Walkerhill and was the opening General Manager of W Beijing before moving to Shanghai. “I’m very excited to be working with such a cohesive team at The Westin Bund Center Shanghai. As one of Shanghai's leading iconic hotels, I look forward to continue showcasing the Westin instinctive and personalized service to ensure that all guests will leave feeling better than when they arrived,” Findlay said. “I'm also excited to be working in Shanghai, one of the most dynamic and cosmopolitan cities in China,” he added. Just a stroll away is the magnificent Bund architectural site and waterfront. Yu garden, a 400-year-old classical Chinese garden and the popular pedestrian shopping precinct on Nanjing Road are also within short walking distance. Lujiazhui Financial District is a mere 10-minute taxi ride away. Guests will be pleasantly delighted on arrival with the grand atrium lobby featuring a striking cantilevered glass staircase inlaid with delicate rice paper and beautiful soft-glow lighting. With 570 tastefully-decorated guest rooms and suites offered in two towers, other services and facilities include restaurants serving Chinese, Italian and international favorites including the city’s famous Sunday Brunch, a Westin Workout fitness centre with indoor swimming pool and Banyan Tree Spa.